We can all agree that Brooklyn Nine-Nine is a brilliant police-station sitcom with hilarious jokes, progressive politics, diverse casting, and engaging cases-of-the-week… but what if it were the opposite of that? Well, then it would be Debra Messing’s latest attempt at career suicide, The Mysteries of Laura, a god-awful police-procedural dramedy that pitches her as “a homicide detective with the New York Police Department who balances her day job with her off-duty hours as a single mother to twin sons, while trying to get her soon-to-be-ex-husband to sign the divorce papers.” Meh. At the end of the pilot episode, after she’d finally convinced her douchey dumbass baby-daddy to finalise their divorce, he turned around and announced that he’d just been promoted to take over as captain of her department… at which point I swore aloud at my TV, because… seriously… f*ck that! And her kids… ye gods, her kids! There’s actually a scene where she and hubby are bickering in a park in the middle of the afternoon, and the “boisterous” boys start urinating on each other for fun, in plain sight of everyone… a random passer-by actually has to yell for the parents’ attention, to stop the impromptu “watersports” session! Of course there’s a later scene where she’s putting them to bed and they’re all “We love you, mommy!”, to try and soften their image… but it does nothing to dispel the first impression of them as chuckling sociopathic deviants. If they don’t both grow up to be career politicians, I’ll eat my hat! As for the supporting cast, Janina Gavankar plays ‘Meredith Bose’, the station’s resident killjoy, who just acts pissy in every scene and contributes nothing to the story or the “solve”… in fact, it was her character that inspired me to make the B99 comparison, because it’s kinda like they took Santiago and Diaz, sucked out all their humour, intelligence, and personality, then combined them into a single character. Feh. 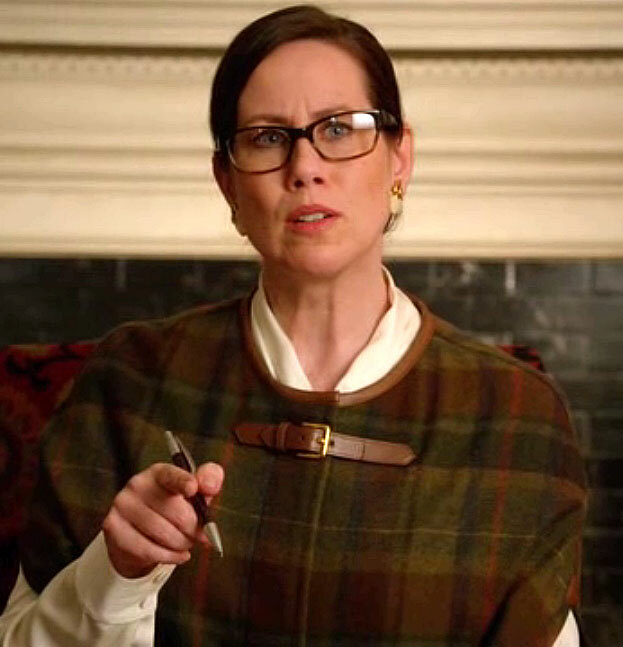 The vastly overqualified Miriam Shor also cropped up in a cameo role as ‘Eleanor Caldecott’, the grande dame of a fancy school who quite rightly turned her nose up at Laura’s misbegotten family, after one of the boys threw up over Laura’s lap, presumably as a reaction to the cough syrup she’d doped them up with in the previous scene! Incidentally, our heroine also straight-up blackmailed a cheerleading coach (Ilana Becker) into arranging the interview for her, after checking the number plates of every car parked outside the school, and wasting valuable police resources to check the backgrounds of every staff member! What a horrible, horrible person she is! Despite her sharp-shooting and crime-solving skills, she’s also quite a crappy detective, because this week’s big murder actually happened while she was stood in the very same (smallish) room with both the murderer (her captain/mentor) and the victim, and she didn’t notice a damn thing! Such a mind-numbingly, insultingly stupid storyline. GAH!!! I guess the show-makers are banking on Messing’s charm and comedic chops to win the audience over… but it’s an uphill struggle from the outset. In fairness, I wasn’t that impressed with the B99 pilot either, and found Andy Samberg intensely annoying, but there were enough decent laughs and likeable characters/actors in the ensemble to tempt me back for a second and third episode. This show has all sorts of problems with the basic premise of this show, that would be a lot harder to smooth out in subsequent episodes… unless the ex-husband’s announcement is revealed to be a wacky prank at the start of the following episode… or he immediately murders someone and gets caught, just like the previous captain did? This entry was posted in Rants about TV and tagged Brooklyn Nine-Nine, Debra Messing, Ilana Becker, Janina Gavankar, Miriam Shor, The Mysteries of Laura. Bookmark the permalink.